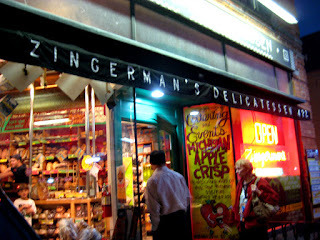 Zingerman's was not the longest I've traveled for dinner. A few years ago, while doing a short stint in Madison, my colleague insisted that the best steak in the world was just down the road, outside of Milwaukee. And while working in Oshawa, Ontario, the hour-long trip over to Toronto was rewarded with some pretty outstanding dinners. Still, it takes a mighty fine establishment to merit 3 hours of driving; and Zingerman's delivered, if not in the Pastrami than in the experience of the place, which is nothing short of brilliant, an overwhelming array of clever, cute and above obsessively food-centric. It's a compound more than a restaurant, and maybe more an empire than a compound. 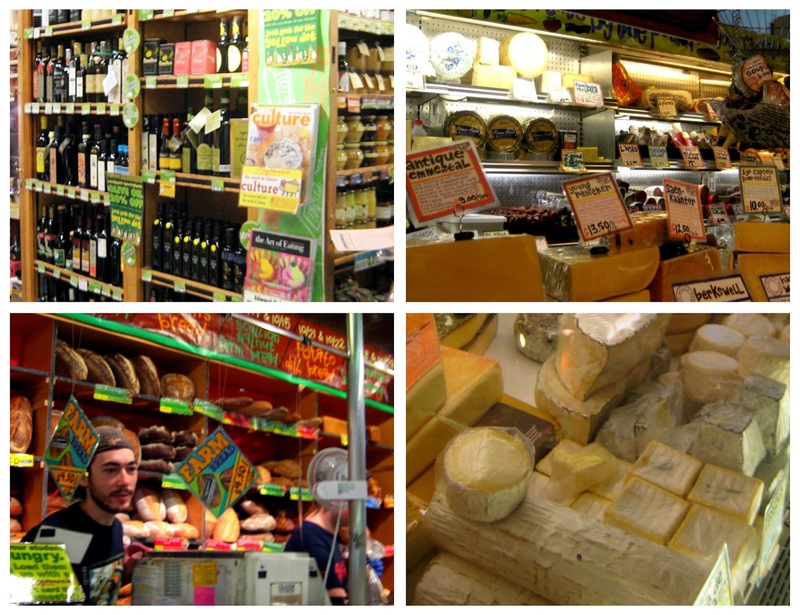 The center of the Zingerman's empire is deli/cheese shop/bakery attached by a patio to a coffee shop and gelato stand, both intertwined with retail chocolate, cooking supplies, exotic dry goods, and a massive amount of exceedingly whimsical signage. Down the street is the Roadhouse, which will be the object of another road trip soon, and somewhere in the mix is a massive mail-order operation and a kitchen that I can only imagine. Here's how it goes down. You pull into cute-as-a-button brick-street Kerrytown a few miles off the highway, far enough through nondescript neighborhoods that you begin to doubt your GPS. You look for parking. If lucky, you find it. You walk in through what looks like a regular deli entrance - large black awnings and warm window displays into a warmly lit room that redefines overstuffed. On your left, cheese. Beyond that, meats. The selections are truly mind boggling - 8 varieties of bone-in Spanish Hams. On your right, a wall of breads, fronted by friendly guys with beards. Keep walking, one very small step at a time, toward the giant menu boards that loom above the sandwich station. While you're wondering how this is all supposed to result in you getting a sandwich, a nice person with a clip-board approaches you and works with you to select the right sandwich for your particular needs and desires. You select a Pastrami, specifically the JJ's Special, with grilled onions and swiss cheese. You hope you like it, because the sucker is $16. Once you find your seat, out on the multi-level patio between the Deli and the Gelato, and pull down your drink from the all-Boylen soda fountain, your Pastrami arrives. And that Pastrami? It sets the bar for all others. The thick slices, which I was skeptical of at first glance, showcase the delicate texture and distinct bite. This is not lean meat, but unlike most attempts at deli meat, all that fatty tasty goodness is evenly and beautifully distributed - nothing stringy, nothing to get stuck in your teeth. The bread is dense enough and has enough of a toast to it to stand up to the mass of the sandwich, waiting to fall apart until the very last bite. I've had pastrami this good only one other time, at Katzinger's in Columbus, Ohio, a much longer drive from Lansing. After dinner, despite being completely stuffed, I managed to find room for a slice of exceptional apple pie and a decent cup of house-roasted coffee. Zingerman's has earned it's imperial stripes - they roast coffee because they wanted really good coffee, they make bread because they needed the bread to be perfect, they make cheese because all the cheese they wanted wasn't made by anyone else. I love that kind of empire - it's generous and wide-stretching, raising the bar for anyone making a sandwich and providing the resources to get there. 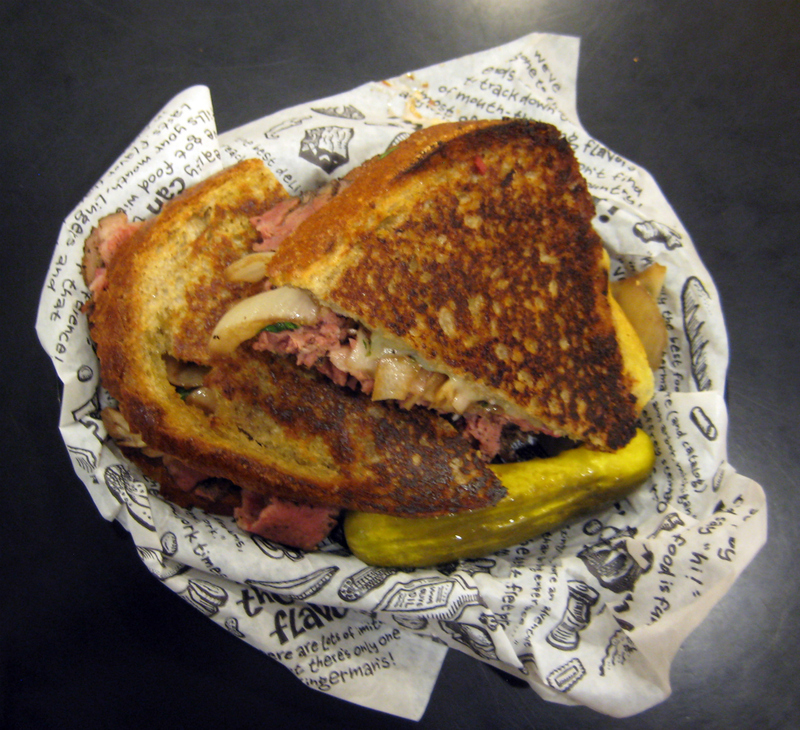 Yup, it might cost a bit more, but Zingerman's is definitely the best place for all things deli and sandwich...the #18 Georgia Rueben is killer, too! Thanks for the awesome post - spot-on, brilliant! Thanks guys! I have to say, the trip out to A2 leaves the options in Lansing looking a little dreary. Ah well - rental cars have unlimited miles for a reason right? Comfort Food in East Lansing: What Up Dawg?